The art of the cover song is much underutilized in music today. Sure, you might hear your favorite band belt out a tribute to Jimi Hendrix during a concert, but it’s quite rare you’ll hear that same track be placed on their next album release. Today’s album has 10 tracks, only three of which were written by the artist. John Robert Cocker was born in Sheffield, England in May of 1944. The name John didn’t stick for long—and there are varying stories as to how that happened. The most accepted is that John used to play a game when he was a kid where he’d refer to himself as “Cowboy Joe.” He played it so much and was so into character, they simply began calling him Joe. From that young age, he was entranced by the music of Ray Charles—his vocals, the style—he loved everything about him. Joe’s first music experience was when his older brother invited him on stage to sing at age 12. Almost immediately he felt at home, and began starting his own side bands to play at local youth clubs and around town. After finishing school, he began singing under a pseudonym, but had modest success at best. It wasn’t until the late 60s when Cocker would begin to put together his first studio album under his own name. 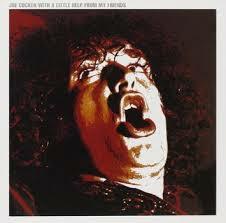 With A Little Help From My Friends was released in April of 1969. The album title being named after the lead single, which was originally performed by The Beatles on their infamous ‘Sgt. Pepper’s’ album. Cocker had help on the track, with Led Zeppelin’s Jimmy Page providing the guitar work, well-recognized drummer BJ Wilson hitting the skins, and session singers Sue and Sunny providing the backing vocals. Paul McCartney gave the thumbs up for the track to be covered, especially after hearing the drastically different arrangement. It had gone from a sort of silly pop song to a mind-blowing soul anthem and McCartney loved it. He would go on to say he was forever grateful for Cocker changing the sound the way he did. Like many folks of a younger generation, your first exposure to Joe Cocker may have been the theme song of the television show ‘The Wonder Years.’ Since the program ran from 1988 to 1993, it exposed a whole new generation to the work of Joe Cocker and The Beatles. I can recall even as a young kid being enthralled by Cocker’s vocals—they’re so raw and emotional, something he definitely learned from the great Ray Charles. It had the gruff sound of Dylan, but so much more passion than just a folk singer. The album would see solid success on the charts, and is certified Gold in the U.S. today. There is something so refreshingly bluesy and rock-ish on this album, combined with Cocker’s soulful passion, it’s really second to none. And the fact he turned so many other artists’ work and made them his own, I wish more artists would do the same. Sadly, Joe Cocker passed away in 2014 at age 70 from lung cancer. At his funeral, music legends Bill Joel, Ringo Starr and McCartney all came to pay tribute. You can pay tribute today for $5 bucks by picking this up and remembering Mr. Cocker and his great music. Fun fact: Joe Cocker built an English style estate home in the Hotchkiss serving area. The ranch had a sign out front “Mad Dogs and Englishmen.” Don’t know if its still there.